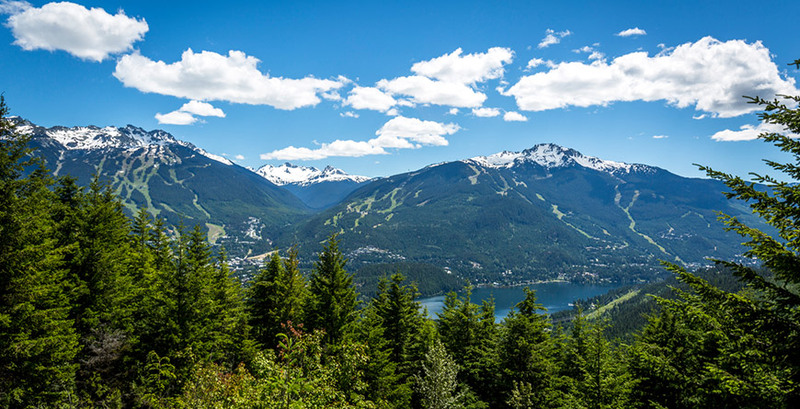 Escape to Whistler for a retreat in the mountains. Here are our favourite ways to unplug, unwind and reconnect. It’s all about slowing down, going local, and getting a dose of fresh mountain air. 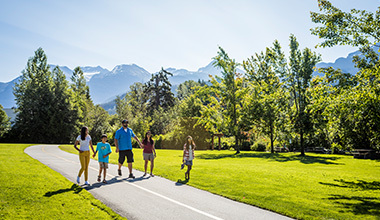 Take your book, yoga mat or runners down to one of Whistler’s lakes for a peaceful start to your day. Water is the brain’s natural de-stressor, just looking at it makes the mind calm. A cool dip first thing is sure to energize you for the rest of the day. Visiting in the winter? Grab a hot coffee and stroll around the winter wonderland via the Valley Trail. Rest and reset with traditional Finnish hydrotherapy at the Scandinave Spa. With a steam room, hammocks, sauna, yoga room, plunge pools and more there are plenty of options for each cold-hot-relax cycle. The spa offers a full range of massage services (Swedish included) and an onsite café – you could spend all day rejuvenating there. Practice Shinrin-yoku (forest bathing) on the trails in Whistler for lower blood pressure, a clearer mind and happy joints. Or, find your flow state on a bike, skis, snowshoes or stand-up paddleboard, the options for moving meditation are endless. Whichever you choose, breathe deep and let that fresh mountain air vitalize you. Wander through the Whistler Farmers’ Market in the summer months for fresh made juices, tasty smoothies and local produce. Try out Whistler’s cafés and restaurants that have mastered making healthy dining delicious like The Green Moustache, Naked Sprout and Alta Bistro. Whistler is brimming with world-class yoga instructors and studios, each with their own vibe. Find your favourite or practice at them all. For something unique, check out upcoming events and you may find yourself rolling out your mat amongst materpieces at the Audain Art Museum or in the Longhouse of the Squamsih Lil’wat Cultural Centre. If you want to see Whistler turned into a yogi haven, visit mid-summer when Wanderlust takes over the Village. There’s workshops, classes, pop-up markets, free concerts and more. Get hygge in a cozy café or soak up your vitamin D on a sunny patio. Visit Armchair Books for a good book, journal or postcard to pair with a delicious beverage. Meet a friend or chat with the friendly locals. Grow from a new experience that pushes your boundaries or learn something new at one of Whistler’s arts and culture hubs. Interested in holistic health? Go for a snowshoe along the Medicine Trail or visit the Squamish Lil’wat Cultural Centre for a Holistic Tour and Indigenous Tea Ceremony to learn about the uses and medicinal properties of local fauna. You won’t see stars like this in the city. The northern lights are known to visit Whistler for a few special nights a year. There’s nothing like the night sky to put it all into perspective and bring a little magic into the moment. Book your entire vacation with Whistler.com. We've got everything you need for your getaway from transportation, accommodation, activities and more. Our Whistler-based travel consultants can also be reached at 1.800.944.7853 for booking assistance, more ideas and local travel advice. A good set of girl friends can be some of the best vacation partners you could ask for. Learn how to plan the ultimate girls' getaway. Discover Whistler's unlimited season. 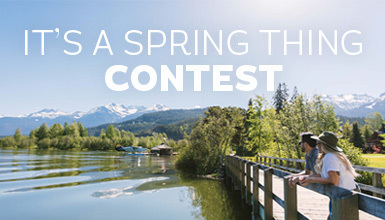 Enter for a chance to celebrate longer days with an extended spring vacation for two.